The European Parliament. Italy is one of the 28 EU members. 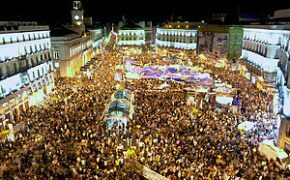 The 28 nation European Union (EU) has been in a state of disarray, since the Great Recession and the resulting financial meltdown in 2008 and 2009. The collapse in the American real estate market left banks, investment firms and numerous individual investors with mortgage backed securities that proved to be toxic. So many of these investments were nonperforming assets, that the entire banking financial system was in danger of collapse. Following the economic downturn, governments across Europe were left with entitlement outlays that were no longer affordable in an age of declining revenues caused by stagnating growth. Sovereign debt increased rapidly in the ensuing years after 2009. GDP (Gross Domestic Product) to debt ratio levels soon were equal or exceeded output in many countries. The sovereign debt crisis toppled a number of governments and led to a fiscal meltdown in a number of nations in the periphery of the common currency zone. Cyprus, Greece, Ireland, Portugal and Spain each in turn were forced to appeal to the European Central Bank (ECB) to avoid bankruptcy and default. While the group as a whole were able to exit the bailout program with the exception of Greece,the overhang of government debt continues to be a threat to the financial stability for most nations in the EU. The years of government largess was now replaced with austerity, yet growth remained elusive. A number of nations even felt compelled to lower interest rates, to prevent a major currency appreciation. This was the case in Denmark, Sweden and Switzerland. The ECB also began to lower rates as a way to stimulate growth and stave off the threat of deflation, in the 19 nation Euro-zone. Before long they were at zero and then by 2014 negative. By 2016, the deposit rate was at -0.4% and 0.25% for lending. The benchmark refinancing rate remained at 0.0%. Asset backed securities were first purchased by the ECB in 2014. However, real quantitative easing by the ECB began in March of 2015, and would be expanded in 2016. In June of this year, the central bank announced that purchasing of corporate bonds would soon commence. The original bond purchase program totaled 1.1 trillion Euros, the equivalent of $1.2 trillion USD (United States Dollar). Earlier this year bond purchases were increased from 60 billion Euros to 80 billion, on a monthly basis. Mario Draghi head of the ECB, has committed the central bank to even more stimulus measures, in an effort to achieve the goal of 2% annual inflation. He is convinced that it is the only way to return the EU to growth. 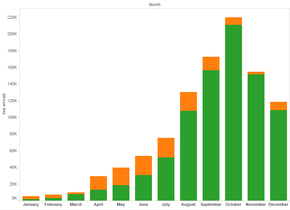 Mediterranean sea arrivals to Greece (green) and Italy (orange) from January to December 2015, according to UNHCR data. As the ECB and a number of European creditors focused on Greek insolvency, the next crisis hit Europe like a wave. In 2015, over 1.2 million migrants and asylum seekers arrived in the EU. It was over twice as many that had arrived in 2014. Over 80% of the refugees are coming from nations beset with chaos and war. They are mostly from the countries of Afghanistan, Eritrea, Iraq, Somalia and Syria. The tidal wave of humanity has overwhelmed both the public services and tolerance of many countries in the region. It has put pressure on the open borders that were created with the Schengen Agreement within the EU. Some borders in Europe have already been closed, for at least the time being. Since November of 2015, Croatia, Macedonia and Serbia have restricted passage across their borders. Hungary also has closed its southern borders, in the face of increasing numbers that were pouring into the country. Greece has been inundated with a tide of humanity and is ill equipped to deal, with the numbers of people that have arrived on their shores. 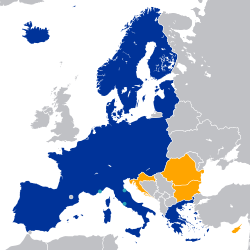 Schengen Area is colored in blue, yellow are those nations obligated to join in the future. In February of this year, Austria started limiting the number of migrants that will accepted daily. Slovenia is also employing the same tactic. Germany has taken in the most refugees to date, which now number over one million in that country alone. Despite the tentative agreement with Turkey for the refugees to be kept there, before they attempt a crossing to Europe, the arrival of new migrants continues in the Balkans and across the Mediterranean Sea. Italy has been taking in large numbers of asylum seekers as well from North Africa. However, many of these are most likely economic refugees rather than political ones. As European leaders were struggling to deal with the ongoing migrant issue, acts of terrorism in Belgium and France heightened public concern towards public safety and border controls. Less well know incidents of hooliganism in Germany and Sweden by Muslim immigrants, is already created a political backlash in these two countries. Hungary has already announced a national referendum for October, that will deal with EU refugee quotas. This type of protest by individual countries in the 28 member EU, is likely to be duplicated elsewhere. Muslim immigration into Eastern Europe is not very popular. In addition to Hungary, the Czech Republic, Romania and Slovakia have all rejected mandatory refugee quotas. The next issue that would roil European markets and threaten unity, was the referendum in the United Kingdom known as the Brexit. The electorate was to determine if the country would continue in the EU. Despite numerous polls indicating a slight majority in favor of remaining in the bloc, the actual vote was 51.9% in favor of leaving. As a result of the vote, nearly $3 trillion USD of equity in global markets was wiped out in the next two trading days. Although the major stock indexes in the United States experienced somewhat a rebound, those in Europe have not recovered. There is an ongoing debate whether the United Kingdom will eventually profit from the EU withdrawal. A further difficulty for the United Kingdom is that the vote to remain, was overwhelming in both Northern Ireland and Scotland. Therefore the likelihood of another referendum on independence in Scotland, has increased greatly. The issue of immigration, business regulations and ever more rules coming from the EU, were the deciding factor in the Brexit vote. The British wanted to preserve their dwindling sovereignty. There is a similar sentiment across the Channel in Denmark, Greece, Hungary, the Netherlands, Sweden, and even in France. In the face of all this internal turmoil, an increasingly militarily resurgent Russia annexed Crimea in 2014, fostered an ongoing rebellion in Eastern Ukraine, and is making threatening moves in the North. This is increasing the anxiety of the Baltic Republics of Estonia, Latvia and Lithuania, as well as Poland. This summer will witness the arrival of the next crisis for Europe. Negative interest rates have put the entire European banking system under pressure. Germany, Italy and Spain in particular, have banks that are not profitable and further consolidation will be urgently needed. 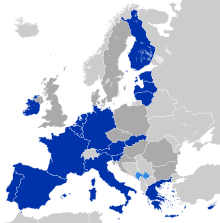 Italy is part of a monetary union, the Euro-zone (dark blue), and of the EU single market. In Italy it is far worse. In recent months there is a question on whether the entire banking system has become insolvent. The banks there are weighed down by near 360 billion Euros ($389 billion USD) in nonperforming loans. It is quadruple the rate that existed in 2008 and is still rising. This is 17% of the entire loan portfolio. For a comparison, it is ten times the level that exists in the United States. Even at the height of the 2008-09 financial crisis, the American rate of bad loans was only 5%. The government is steadfastly working with the European Commission, in attempting to find a solution to this growing problem. There is increasing recognition that it will be beyond a national solution, given the size of the shortfall. Years of lax supervision in lending, have sent Italian bankruptcies soaring in the new environment of slow growth and negative interest rates. When the financial crisis of 2008 arrived, many Italian banks took the step of rolling over loans for borrowers who were unable to repay. The sentiment at the time was when the economy recovered, so would the bad loan situation. There was no contingency plan if this failed to materialize. Among public traded banks in the Euro-zone, Italian lenders account for nearly half of the total in bad loans. Cutting costs and further job reductions alone, will be insufficient. The Italians are now widely in favor, of using taxpayer money as the backup in the unfolding crisis. Italy is about to test the model, the EU put in place to handle troubled banks two years ago. The Italian government instead has asked for authorization to inject some 40 billion Euros, into the banking sector as a stabilization tactic. If this is permitted, it will largely undo the agreed upon framework, that is mostly an anti-bailout concept. The idea is that the stakeholders in the individual bank, should pay a financial price far ahead of any public infusion of funds. Italy insists this should be done to prevent a cascade of bank failures not only domestically, but throughout the EU. 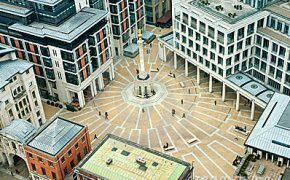 With the shares of numerous banks down by 30% or more since the Brexit, there are many that feel that the request made by Italy seems reasonable. A number of more frugal EU member nations remain unconvinced. Led by Germany, the concern is that taxpayers will end up being responsible, for the poor decisions of bankers made over many years. The European Commission for now, is following the position supported by Germany. Meanwhile, the situation in Italy continues to deteriorate. On the whole the banks seem unable to disentangle themselves from the numerous bad loans. This is because they insist on a valuation that is far higher, than what potential investors are willing to pay. It means that the eventual write offs will be enormous, with tens of billions more in bank losses. The legal system in Italy compounds the difficulty in reforming the financial sector. It takes on average, 8 years to clear a bad loan. Personal property and business assets are often intermingled, making it even more problematic. As economic growth continues to slow across Europe and globally,the ECB may be tempted to push historical low rates even further into negative territory. This will of course compound the problem, by making the banks in Italy and elsewhere even less profitable. A major underlining ongoing issue, is the general lack of economic growth in Italy since the country adopted the Euro in 2002. Even more troubling is the GDP to debt ratio, which reached 132.70% in 2015. GDP rose by just 0.3% in the first quarter of 2016, only half the rate experienced for the Euro-zone as a whole. Italian retail sales have dropped for six consecutive months and the sector is now in the worst slump since the end of 2013. It is no wonder, that Italians are losing faith in the Euro-zone. Demands for a referendum on Italy’s future participation in the common currency bloc are rising. It could well be the first step in a Italian withdrawal from the EU itself. Prime Minister Matteo Renzi may well lose an upcoming vote, on much needed constitutional reform. If that leads to his resignation, further progress on financial issues will be delayed, once again. There is no doubt under these circumstances, the anti-euro party known as the Five Star Movement, will make additional gains in a future election. As aforementioned, the increasingly unsound European banking system is creating an additional impediment, for a return to economic growth and monetary normalcy. Skepticism on the long term survival of the Euro-zone and the European Union is making ever larger inroads, among the electorate in Italy and elsewhere.